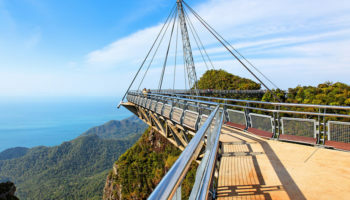 The Malaysian paradise island of Langkawi is a perfect combination of white sandy beaches, clear turquoise waters, thick luscious jungle and mountainous landscapes. 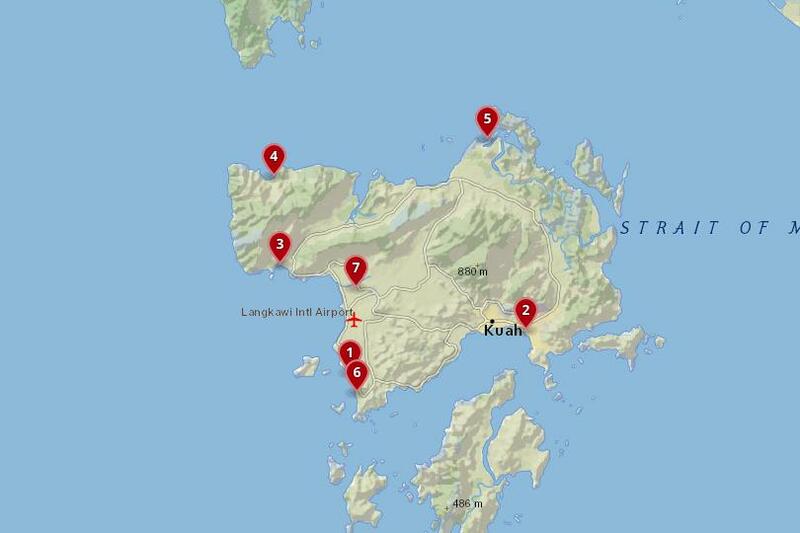 But the island has seen much development in recent years and is easy to reach by boat and plane at the international airport. Stay in the popular resort of Pantai Cenang along its palm-lined curved white sand beach and find yourself where all the action takes place. This is the busiest beach on the island and is packed full of people wanting to enjoy the sun, views of the clear Andaman Sea and try out one of the many water sports on offer. Accommodation in this family-friendly area is very varied, from basic backpacker beach huts, to mid-range resorts and a handful upper end, all-inclusive hotels, so there is something to suit everyone’s budget. A lot of the bigger resorts are open to the beach and have manicured gardens and beachside pool areas along with restaurants and bars. Pantai Cenang is about a 15 minute drive from the main airport in Langkawi and is easy to reach by taxi. The area has many different cafes, restaurants and bars to choose from, many of which serving a wide range of dishes from various cultures. Meritus Pelangi Beach Resort – Immaculately maintained, and with staff who make guests feel well looked after, this 5-star resort hotel is set along the sandy beachside. Spend your time here chilling in the luxury wooden chalets, enjoying spa treatments, reclining on the private beach, swimming in one of the outdoor pools, and dining in one of four restaurants on offer. Rooms here overlook the ocean or the tropical gardens and are a relaxing, stylish space to spend your free time. Guests can make use of a babysitting service, and there’s a gym as well as water sports activities to try out. Telaga Terrace Boutique Resort – This resort comes complete with everything you’ll need to make your holiday as fun as possible. There’s an outdoor pool, a wellness center, and other handy things on offer – including bicycle hire. As you’d expect from a boutique hotel, rooms are simple, cozy and stylish, and come with touches of Eastern-inspired decoration. Set in a quiet end of the town, less than a ten-minute walk from here and you can feel the sand between your toes at Cenang Beach or stroll to the nearby Cenang Supermarket, complete with its own food court. The Rice Museum is less than 500 meters away, too. Nadias Hotel Cenang Langkawi – Located right in the center of Cenang Beach in a lively area, this newly-built hotel features simple, modern rooms perfect for a peaceful night’s sleep, but it is also in the middle of the action. A rooftop bar looks over the street and the ocean, so you can spend time soaking up sunsets and watching people in the square below. 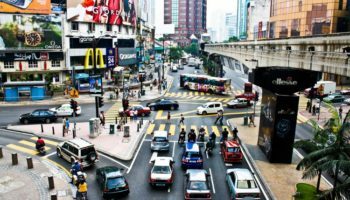 Next door to the hotel is the Cenang Mall, and around the area is a wide choice of seafood restaurants and food vendors. If you want some time away from the buzz of the area, you can take a relaxing swim in the hotel pool or chill out in the Jacuzzi. Just a short walk from the main ferry terminal in Langkawi is Kuah Town. Built on reclaimed land close to the water, Kuah is the biggest town on Langkawi and is where most people will arrive on the island. 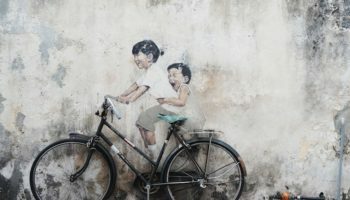 The town isn’t the idyllic picture of a paradise island that you might have imagined as your boat pulls in to the dock; Kuah is more about the shopping rather than its beaches. The port town is still a good place to stay if you are looking for accommodation close to transport links and on a budget. Kuah town itself is lined with duty-free shops which sell everything you could ever want, from perfume to tobacco and a whole lot more. Accommodation is cheaper here than on the rest of the island, but there is one five star spa resort here as well! The St. Regis Langkawi – For travelers who want a tropical retreat surrounded by the jungle, this dreamy 5-star hotel could be your dream destination. Sit back and relax in a world of luxurious calm as the staff at this hotel help you out with every request and create a wonderfully low-key ambiance. Select one of the various suites on offer and wake up to views of the lush rainforest, or have direct access to the hotel pool – there are also panoramic sunset villas. The location of this resort means that you’ll be surrounded by nature, so don’t be surprised to see birds of paradise fly by your window! Adya Hotel Langkawi – With a chic touch of Moroccan style, this modern hotel offers amazing facilities and has a warm and welcoming atmosphere. It is close to the Langkawi Shopping Complex as well as Kuah Night Market, so guests will get the chance to enjoy a slice of local life – or just spend days gazing out across the ocean from the pool. The hotel features Muslim-friendly facilities, such as a female-only pool and a halal restaurant, which means everyone can enjoy a stress-free holiday. The Ocean Residence Langkawi – With its huge array of stylish rooms, suites, and villas to choose from, this hotel provides a friendly and welcoming place for many different types of travelers. Families can enjoy holidays here in deluxe family rooms, while couples can opt for a privacy in their own deluxe villa. Whatever your travel requirements, you’re bound to love stepping from your sun terrace right into the swimming pool, or relaxing in peace and quiet surrounded by mountains as the sun sets. This 3-star offering features its own restaurant, but there are also many local restaurants – such as Mahsuri Bamboo – plus there’s a selection of food stalls just a ten-minute walk away. If you are on Langkawi to soak up the sun in luxurious surroundings then Pantai Kok is the area for you. The beach here is clean and beautiful and is perfect for those looking for some relaxation during their holiday. The high-end accommodation available in Pantai Kok comes with stunning views and beautiful attention to detail. Nearby is the contemporary Telaga Harbour which houses everything you should need during your stay: shopping, bars and restaurants as well as amenities such as a bank and a post office. The depths of the jungle is never far away on Langkawi and nearby is the fun cable-car to the top of Mat Cincang Mountain and the Telaga Tujuh Waterfall. Berjaya Langkawi Resort – Set right on the fringes of the rainforest on the water’s edge, this resort is pretty much a honeymooner’s dream. 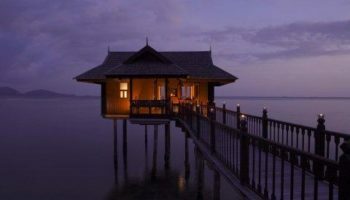 This decidedly 5-star resort is made up of a range of traditional Malay-style villas that are all connected by wooden boardwalks; utterly stylish and serene, some villas sit on stilts over the water itself. Indulge yourself by spending time watching the sky change color over the stunning scenery, dine with your over half over a candlelit dinner at one of four restaurants, sip cocktails at one of the three bars and unwind in the outdoor pool. The Danna Langkawi – Boasting high standards of luxury, this elegant, colonial-style hotel features staff who work hard so that guests have an amazing stay. There’s so much on offer at The Danna Langkawi that you’ll find it hard to leave the comfort to explore the rest of the island. Enjoy days sunbathing on the private beach, cool off in the super impressive infinity pool, and when you’re hungry, tuck into the delicious food at any one of the three onsite restaurants. Rooms come with wooden floors, huge comfortable beds, and boast the ultimate in luxury – including a rain shower. Teluk Datai (or Datai Bay) is all about luxury resorts. The stunning sandy beaches and lush green of nature play home to the swanky, exclusive hideaways for those holidaymakers who don’t want to lift a finger during their holiday. Choosing to stay in one of the lavish resorts means you will have access to the wonderful facilities such as spas, quality restaurants and golf courses. 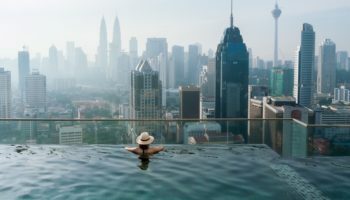 This is the kind of Malaysian resort that you simply won’t want to leave once you have arrived as the hotels here have everything you should possibly need. The nearby area doesn’t have a lot in terms of tourist attractions apart from the Langkawi Crocodile Farm. Hotels in the Datai Bay will also be able to arrange transport around the island for you to visit various tourist locations – if you can peel yourself away from your sunlounger that is! 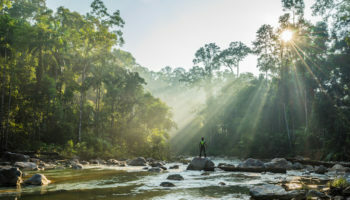 The Datai Langkawi – Like staying among the ruins of a secret jungle temple, this hotel is designed to seamlessly fit into its natural surroundings. A unique place to stay, especially if you like being close to nature, rooms are nestled amongst the tropical flowers. There’s also access to a pristine private beach, which is great since the sea on this part of the island is crystal clear – perfect for swimming and great for snorkeling. The Els golf club is a five-minute drive away and is great for those who like a spot of golf. Tanjung Rhu could secretly be the best spot on the whole of Langkawi. Along the jungle road, through the thick of the trees and on to the fine, sandy, stretch of sand that is Tanjung Rhu beach. A favourite with Malaysian visitors and even locals on the island, the beach is still and quiet with only a handful of hotels in the area. The beachside restaurants around here are small, family-run places that serve up some of the most delicious, fresh food on the island at very reasonable prices. Enjoy discovering the local cuisine with a view of the crystal clear ocean and then after take an afternoon stroll among the soft mangrove sand. The coastline here looks out onto bewitching karst rock formations and many places offer boat trips or guided kayak tours to discover the surrounding seas for yourself. Tanjung Rhu Resort – Situated on a secluded private beach, this resort is the perfect spot for people looking for a quiet place to relax among spectacular seaside surroundings. Rooms are decorated in simple, neutral colours and, along with wooden shutters, hardwood floors and woven rattan furnishings, have the feeling of seamlessly connecting with the tropical landscape outside. It boasts five separate restaurants, a freshwater swimming pool, and lagoon pool. There’s a handy kid’s club too – perfect for when you want to hit the spa for a spot of unwinding. Just around the bay from Pantai Cenang is the more laid-back Pantai Tengah. Relaxing is the main activity here: spend your days laying on the golden sands, taking a dip in the ocean to cool off and then maybe a spot of lunch at a beachside cafe. This is the longest expanse of beach on Langkawi, which means there is plenty of room for everyone to enjoy the blissful surroundings. The beach has a boho atmosphere and is where you will find many backpackers, who stay in one of the many budget guesthouses a little bit further inland – but still in easy walking distance to the beach. There are also beachside resorts here with their own pools and beachside bars for those who have a little more money to spend. 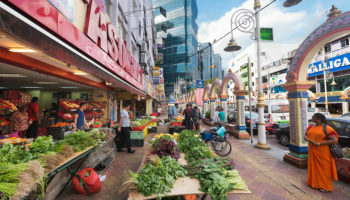 Small bars, restaurants and shops line the main road that runs parallel to the beach and serve a range of food from Lebanese and Italian to traditional Malay curries. 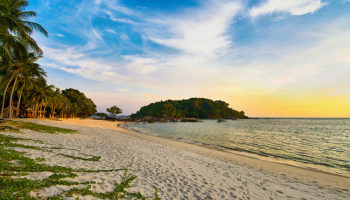 Ambong Ambong Langkawi – Get away from the stress of the modern world at this adult-only hotel, where you can escape your hectic schedule. 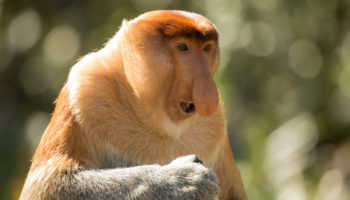 It’s truly a rainforest retreat, so don’t be surprised if you get a visit from local monkeys every morning! Rooms here are a mix of rustic jungle materials with high-end design, to create a comfortable, authentic environment to enjoy the amazing tranquility of the surrounding nature. The staff here are always very helpful and approachable, whilst the hotel restaurant serves up tasty food. 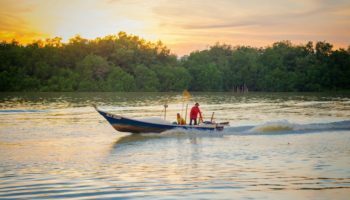 Close to Langkawi International airport, you should stay in Padang Matsirat if you want to discover more about the local life on Langkawi. The area has little in way of public beaches, but does have some lovely resorts with private waterfront access. You will probably want to rent your own transport if you stay in this area so that you can travel around the various interesting sites such as the cultural Batik Art Village, the historically significant Field of Burnt Rice and, if you fancy a spot of retail therapy, the modern Air Hangat Village. On a Sunday night Padang Matsirat holds its own night market, which is a great place to go if you are looking to sample a whole load of tasty local food, often for very low prices. The Smith House – A great budget stay that’s in easy reach of the airport – handy if you’re arriving by plane – this hotel more than exceeds expectations when it comes to value for money. While not located close to a beach, the hotel’s rooftop pool more than makes up for that with its incredible views across the mountains. Rooms are very clean, super modern, and decorated in a trendy boutique design. The hotel cafe and restaurant is a comfortable place to enjoy meals, or you can relax with a book in the hotel library.